For the first time I can remember I did not enjoy my drive through Vermont – and it was a stunning one. Rainbow, misty clouds, rolling storm clouds, deep green valleys with high peaks. I took a new route, up to Albany then east via 7 to 11 out of Bennington. Many interesting towns, mostly ski towns; and crossing though the National Forest. I felt an underlying tenseness though, rather than the feeling of freshness and joy I usually experience. Dread perhaps? Before I left Eric’s I had indigestion. I never really got to relax at Eric’s because of all the followup from moving out, and preparation for the trip to come. I stopped at Hanover and had supper at Canoe, a supper I wasn’t hungry for because I’d cracked open a tub of almonds while crossing the state and managed to eat half of them from the anxiety I was feeling. When I left Canoe and walked past the many college students out enjoying themselves I felt quite alone. I was missing friends, the comfort of proximity to people and places familiar. As I careened up 91 I listened to my mother’s John Denver CD, skipping over all the super-earnest songs to the favorites, and tried to feel some poignancy for what I’m doing. My mind has been dull and numb for a few days. I am both petrified of this new role in my life at KCL, and of the upcoming program that I’m co-coordinating, which I feel ill-prepared to tackle in my current state of mind. I think I’m still in shock that I have completely withdrawn from NYC and am virtually, purposely homeless…homeless but not free. 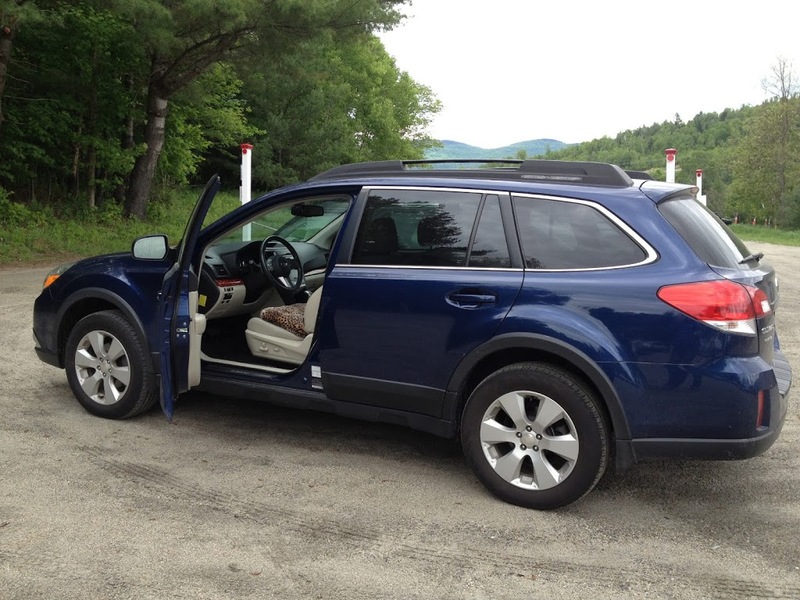 Meet Jewel Song – my 2010 Subaru Outback, in the lot at Karme Choling.